Remember we told you about the ‘Little House on the Trailer‘? Well, here’s another example of what you can do with their small, portable models. Designed as a gallery or art space, this small prefab studio measures 12′ X 20′ with a 10′ ceiling. It’s fully insulated with ready for hook up plumbing, recycled Douglas Fir flooring, and a porch for two – An ideal place for a studio to create and showcase your work. This compact space was created for an artist in Point Reyes whose living space couldn’t accommodate her need for a studio. As i think about it, one of the most important aspect of an art space is natural light. So if you think about it, a portable gallery, like the one pictured below, can actually be moved on a site in a way that enables the artist to maximizes their use of natural light. 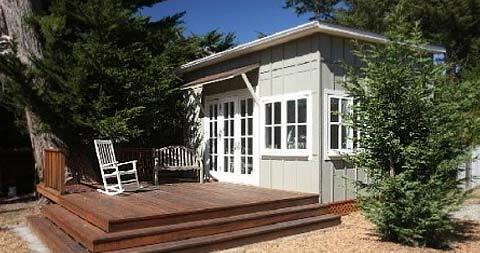 I would like more information about small, portable houses, including price estimates. Please send more info on the House on a Trailer….open as for an art studio. Need price and pictures…. We’re happy to see that our review of this small prefab studio has been drawing a lot of attention lately, where most of you are looking for prices, plans etc. 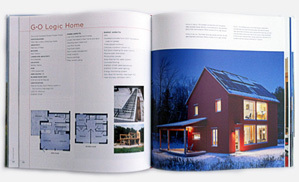 However, please keep in mind that Busyboo.com only writes design and architectural reviews. For sales, pricing or additional info please contact the architect/manufacturer, which in this case is Little House on the Trailer. This is very frustrating. Several people responded asking for more information, but we get nothing useful in return. What is the purpose of the site. Do you have something to sell or are you just cruising to estimate interest? Is there any info on buying a prefab studio? Is this available in the Midwest? Chicago area? Please send info on pricing, options, etc for small pre-fab studio. 12′ x 20′ is the right size. 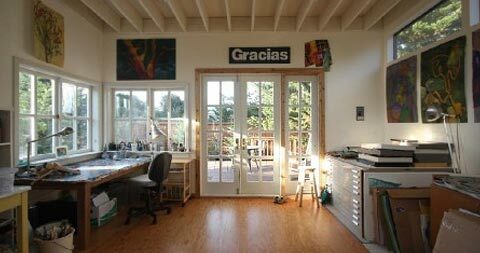 I love the studio, it’s a perfect size for my goldsmith wife, can you please send me more information? I would like more information on the small prefab studio: website, phone, etc. Also, price, etc. I would like more information on the small prefab studio: website, phone, etc. Please include where I could see it, if possible. Also, price, etc. Where can I buy the small prefab studio?